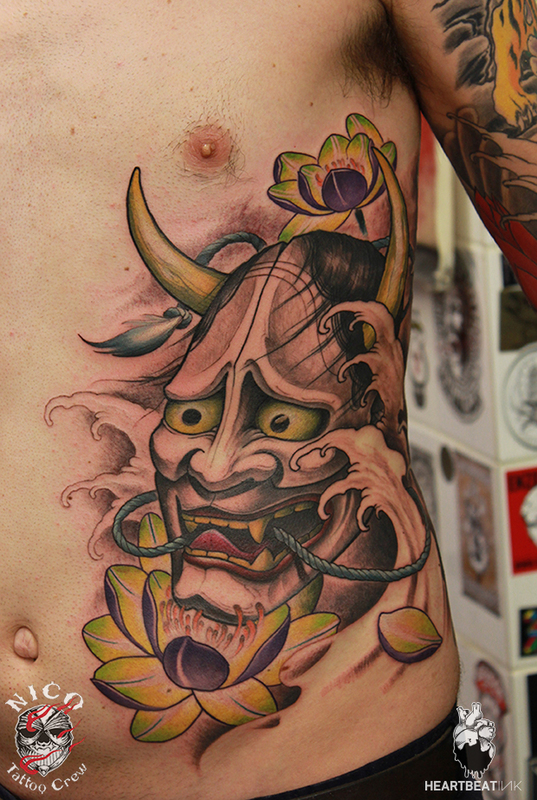 Talented and “measured” Thomas Gramm gave HeartbeatInk an interview about his course, the reasons that led him towards Neo Traditional Japanese tattoo and the tattoo scene in Greece. How come you followed this life path? 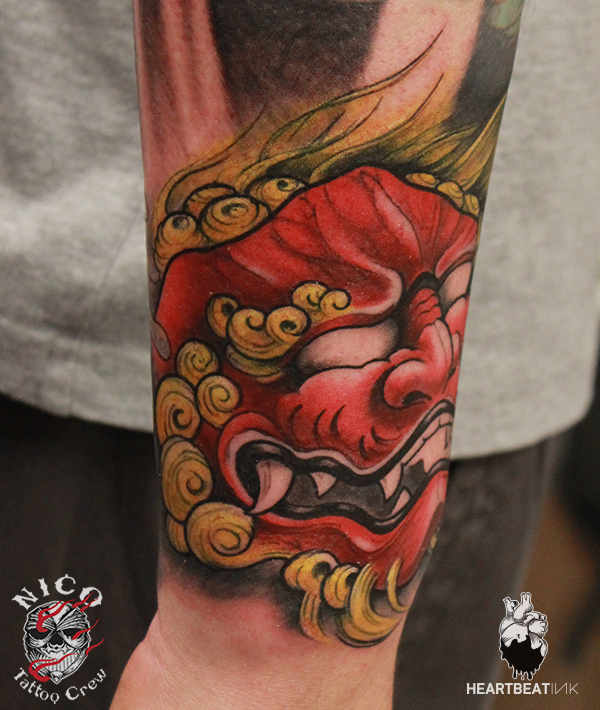 I met Nikos (Nico Tattoo) at Alexandroupoli when I was in year Year 5 in high school, back in 1995. Nikos tattooed at his home, so I went there to have my first tattoo. As a matter of fact, because I was underage, I had asked a friend, who knew Nikos, to say a few good things about me like that I was “one of them”. Back then, I used to skate a lot, had long hair, wore earrings so it wasn’t that hard for Nikos to be convinced that I was a scum (laughs). There were not many like me in Alexandroupoli. We met, I started visiting his studio very often and later we became friends. What made me love tattoos was not the money or the fame. It was the way I became a part of it, how it was done back then. It wasn’t considered a career job. In the beginning, I didn’t have a specific goal, I was just a kid. I always painted. I never imagined I would end up giving tattoos. It just happened. 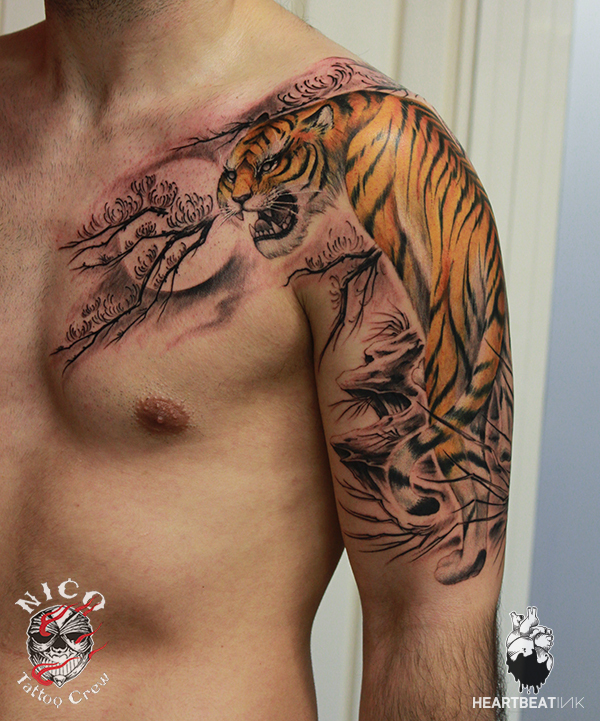 I was almost 17 when I first held a tattoo machine in my hands and the first guy I ever tattooed was Nikos. After I got 18, I used to give one or two tattoos a week. It wasn’t something professional. I was an apprentice for years. I started by cleaning up the place, giving sketches and working at the reception. Later on I got into tattoos. How did you end up in Thessaloniki? I studied graphic design in Thessaloniki in 1996. 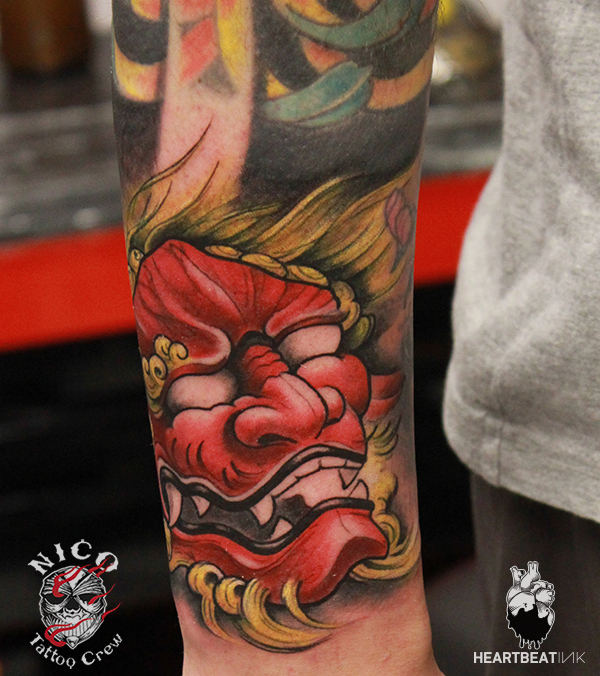 In 1997 the first Nico Tattoo opened there and it was that year when tattooing became something like a job for me. 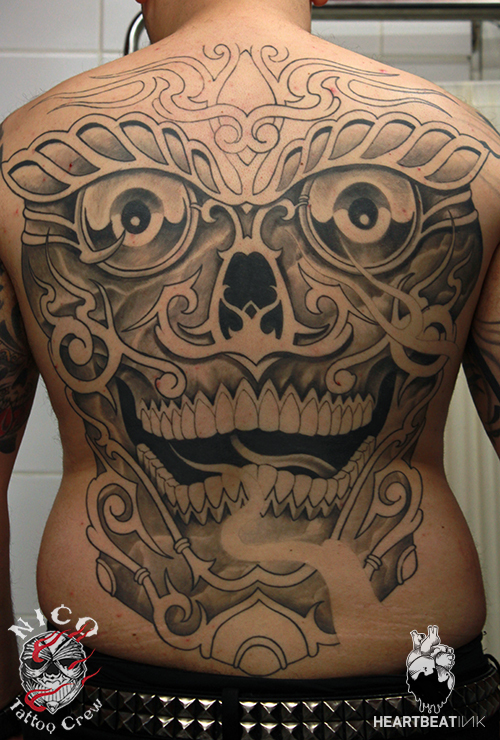 Do you believe that it is necessary for someone to apprentice next to an experienced tattoo artist or is it possible to make it on your own? 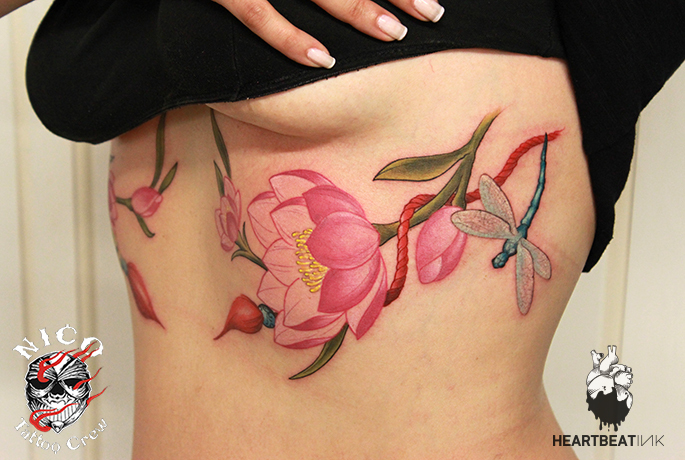 It is very likely to learn tattooing on your own. Nowadays, there is lots of information on YouTube. You can find whatever you want, really fast. Of course it needs time and years of knowledge and experience. 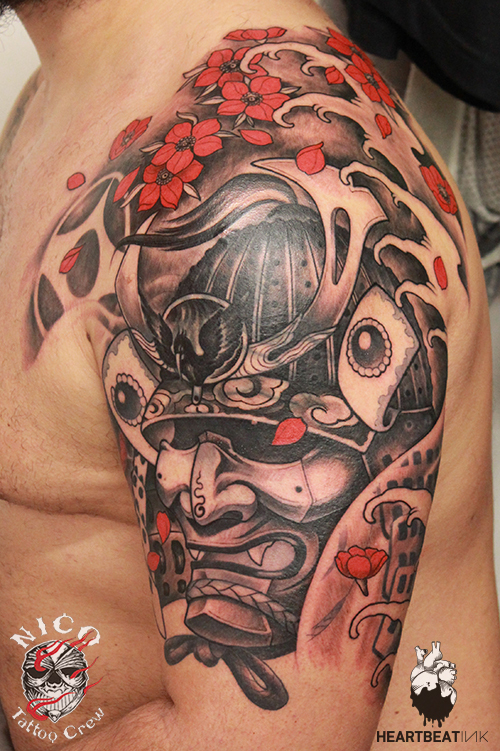 In the first two or three years you get familiar with the technical parts, the body, the tattoo placement, the designs etc. All these you can absorb easier if you are shown by someone experienced. They will teach you how to interact with people. 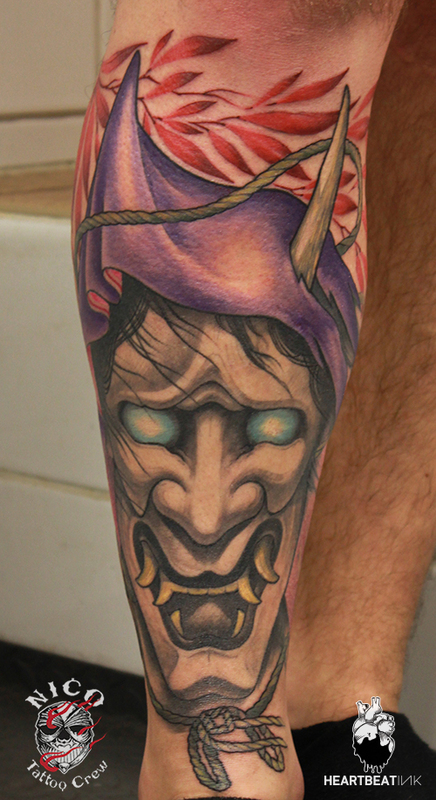 Your style, as far as tattoos are concerned, is somewhere between Traditional and New Traditional Japanese. What led you there? What attracted me most was that the Traditional Japanese style is classical. There is occultism in it and I love its rich range of designs. I believe that it flows better and they work very well as fillers. I have studied the Traditional Japanese style, which constitutes the basis of the New Traditional style, concerning myths, stories, artists, calligraphy, what each thing means, the colours and how they are separated. I also try to enrich it with my own elements. Painting is really important for me. Tattoos are more like art and painting to me. Things are not that strict now concerning symbolism. 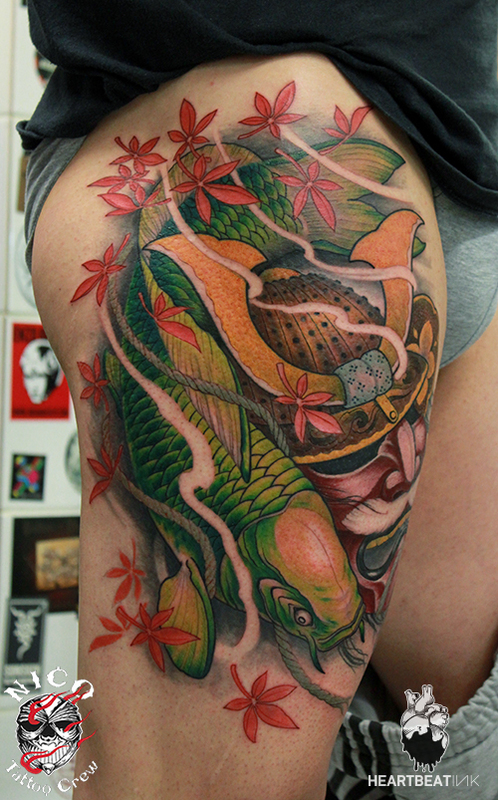 What I say is that, someone who has a koi fish doesn’t mean that he did it for good fortune. Like in the past, the anchor belonged only to sailors. Why get an anchor if you don’t know how to swim? Nowadays, someone can have an anchor just because they like it, or because it is a trend or looks well on their body etc. Of course it’s nicer when a tattoo means something, but that is not the rule. As far as designing is concerned, the waves, for example, are sketched in a specific way. Nobody, though, has exactly the same waves as someone else. Even if someone wants to copy a tattoo, they won’t be getting something completely identical; the way you do the fish scales, the shadows, the fans, how you count the body, the distances, the sizes, the contrast, how you even paint the flowers… Everything is cherry blossom, but noting is absolutely the same. There are some slight changes that make the difference. Your colour palette may change every year. The same can happen to your flowers or your fish. They are all fish, of course, but for someone who is into design, not all are identical. And why, for example, the fish may change every year? They change, because you change. Like it or not. You understand and you consider everything in a different way. Each day you become different. You evolve. The same happens with tattoos. The more you work, the more experienced you get, the more your designs change. 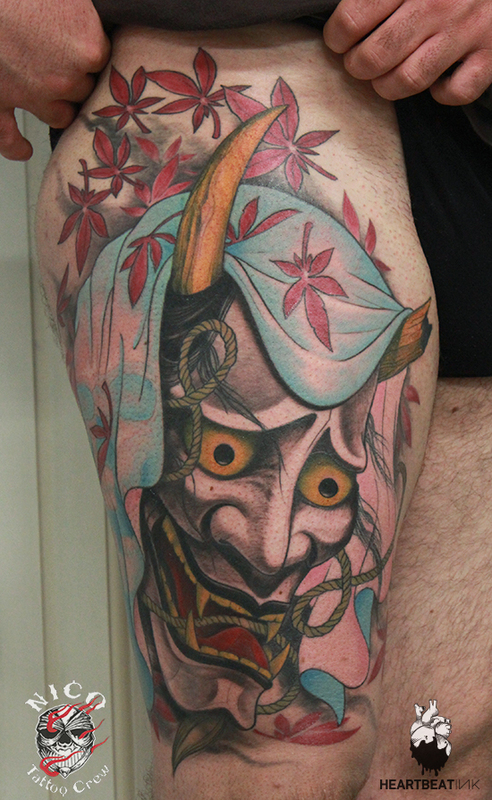 Is there a Tattoo artist in Traditional Japanese style that has been an inspiration for you? 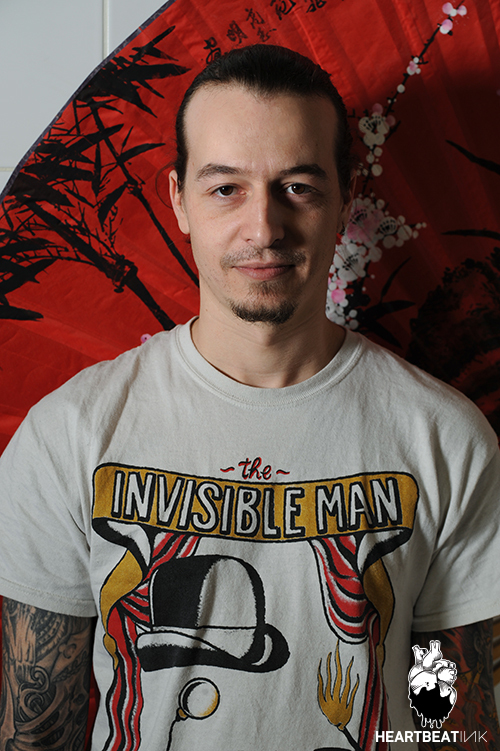 Filip Leu has always been an inspiration for me. 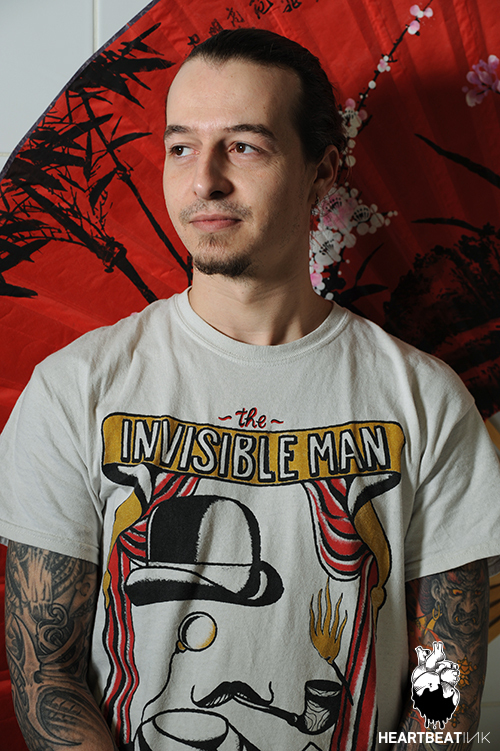 He is a really important artist and I feel so lucky I have a tattoo by him. Why do you think more and more people want to “mark” their bodies with tattoos? Cause, in a way, there are not that many taboos anymore as far as tattoos go. You can see tattoos everywhere now. Even the so called “stars” have tattoos; actors, footballers, singers. Those people are considered to be role models by most of the public; though, they carry tattoos on their bodies. Of course, the design and the material formulation have evolved and as a consequence the tattoo is not believed to be a mark or a scar, but a form of fine art. As generations go by, there’s a better attitude towards many fields that in the past used to be disparaged; like the long hair, the clothes, the piercings and of course the tattoos. Nowadays, our boss may have a tattoo hidden somewhere on his body, or maybe he used to have long hair in the past. He won’t care if his employee has long hair now. An employee will not be judged by that, but by how efficient they are. So there is a general progress. The same thing happens with tattoos. I believe we are fine now and more progress is to be made in the future. 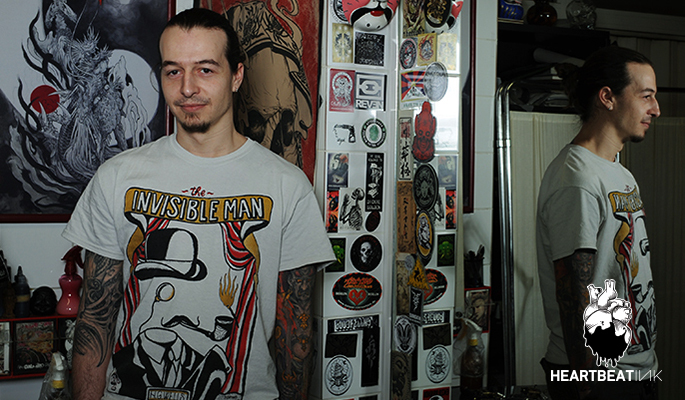 What can you say about the tattoo scene of Athens? 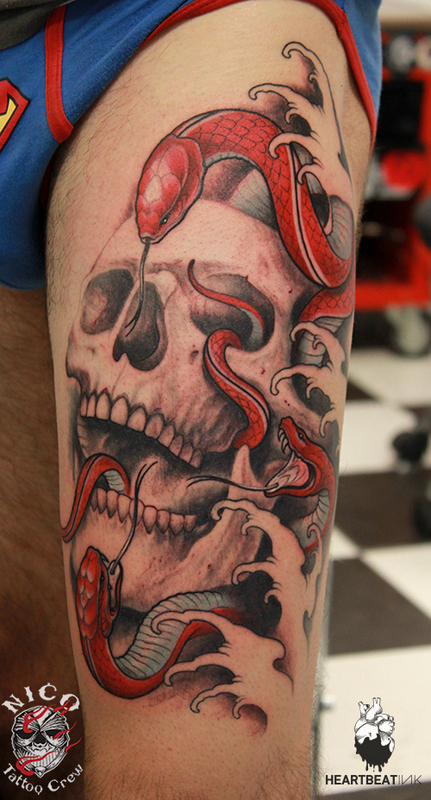 Athens has had interesting things to show recently concerning art and tattoos. The artists that already existed have excelled a lot and the new ones now add some new perspective in design and bring their own ideas. Because Athens is really big, many new studios have opened, but I believe that artists, who have something to say, will stick out. What do you think about the tattoo scene of Thessaloniki? 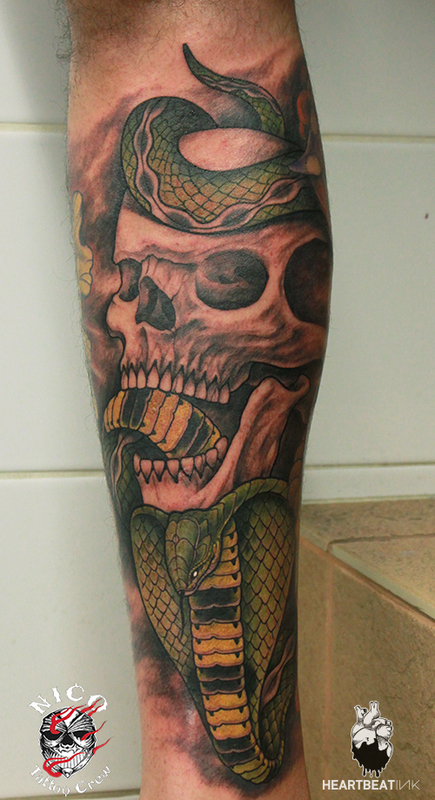 A lot of tattoo studios have opened in Thessaloniki as well. 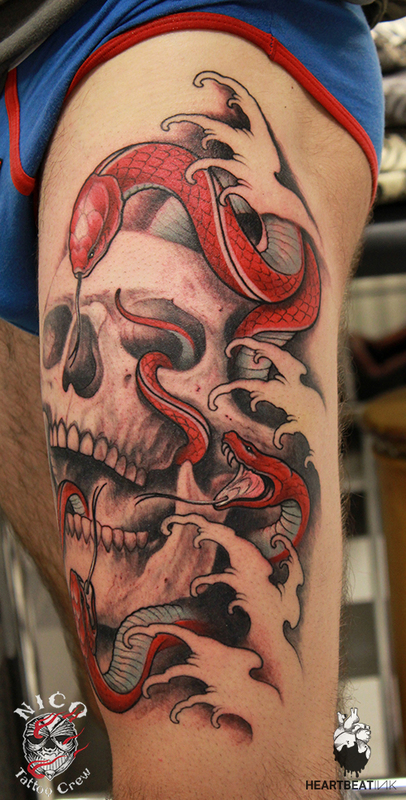 People have more, bigger and more sophisticated tattoos. 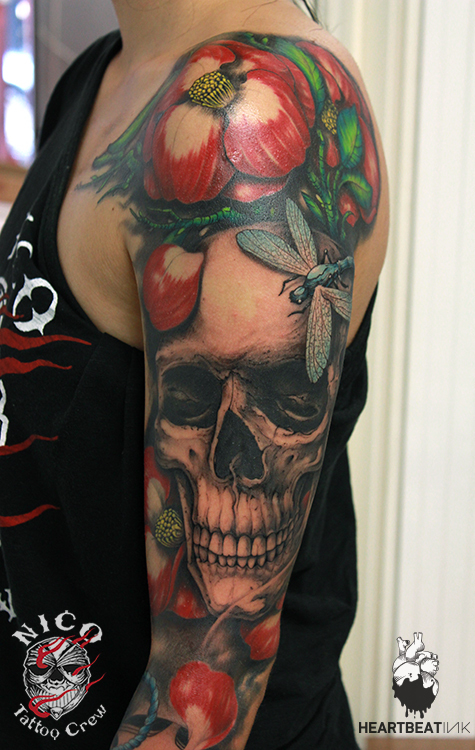 Tattoos have moved along from being disparaged, to be accepted and regarded as art, like they deserve to be. I want to believe that everything happens for a reason. And this is evolution. 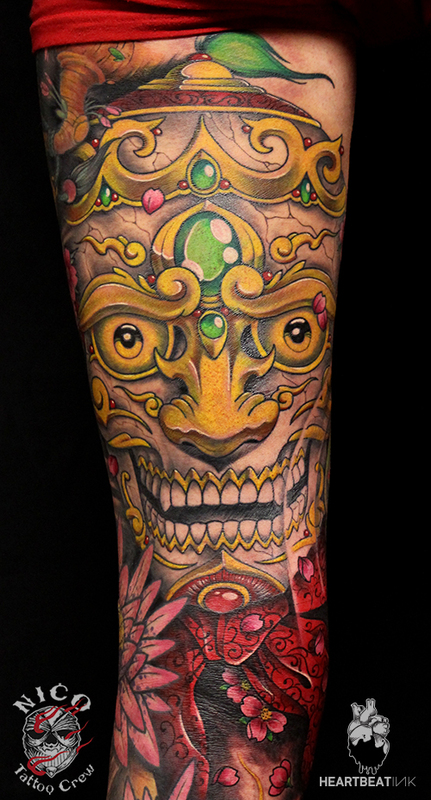 What is your opinion about tattoo conventions and prizes? I believe that all this happens for the people; to bring them closer to tattoos. But who can judge who can win a prize and who cannot. This is completely subjective. So you say that conventions are taking place more for the people and less for the artists? In the past, artists from other countries used to visit and work at conventions in order to show their work and their art. People came to the festivals to see them, because there was no other way to meet them in flesh. Concerning the awards, anyone could compete. Even people whose artists didn’t have a booth at the convention. And the award was not taken home by the artist, but by the collector. I remember they were trying to motivate people to take part in the competition and show their tattoos to the public and most of them didn’t want to, because they thought it was something very personal. As time went by, this changed completely and now more and more people gather to conventions in order to compete. In Holland, during Alkmaar's tattoo convention, there was a 5 euro fee for each entry. The money would go to charities. So who really owns the tattoo? 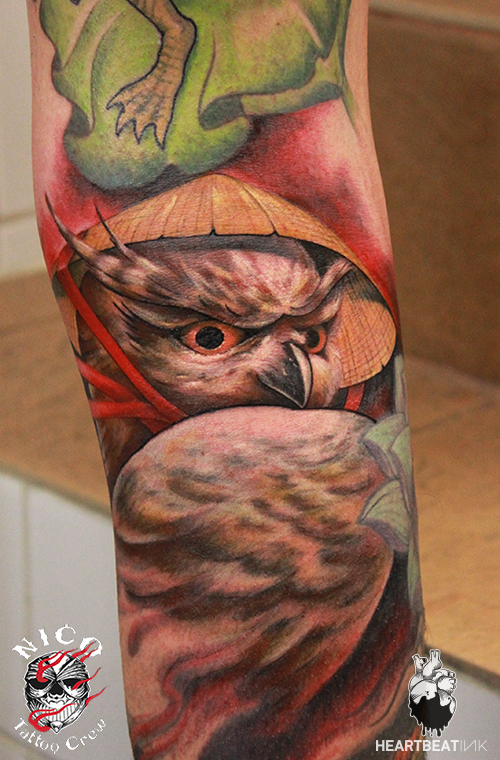 The tattoo constitutes, of course, the work of the tattoo artist, nevertheless, it is carried by the collector, who paid for it or maybe thought of its design and placement.